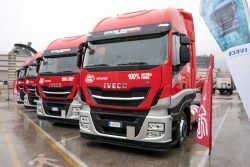 Arcese Trasporti S.p.A., an Italian international transport and logistics company, took delivery of its first low-floor LNG-fuelled trucks from IVECO on April 9. The company says these trucks are in keeping with its commitment to promoting environmentally sustainable. Following the agreement entered into with strategic partner IVECO – also strongly committed to sustainable development – Arcese will be introducing four new Liquid Natural Gas-fuelled IVECO Stralis NP 460 (FP Low floor Tractor) trucks starting from April. The goal is to test their performance and assess the use of this type of vehicles for heavy transportation. In particular, Arcese will run some tests to check consumption, maintenance and management costs and evaluate whether to add these vehicles to its fleet in the FTL Road Freight division (road and multimodal). These vehicles have been chosen because they ensure reduced fuel consumption while maximising load capacity. They are equipped with a 460 hp engine with a double LNG tank, which ensures an autonomy of 1,150 km*, and can be combined with a mega-trailer for higher load capacity. In addition to reducing sound emission compared to diesel engines, this type of tractor reduces NO2 emission by 90%, PM by 99%, and, if biomethane is used, CO2 by 95% compared to equivalent diesel versions**. “Our research and innovation have led to a series of projects that involve the Group’s intention to invest in LNG as an alternative to diesel to make our transport services even more environmentally sustainable”, said Marco Manfredini, Corporate COO of the Arcese Group. “We’re proud to be one of the first logistics operators in Italy to introduce LNG-fuelled low floor trucks and to have IVECO as a partner in this project”, he continued. 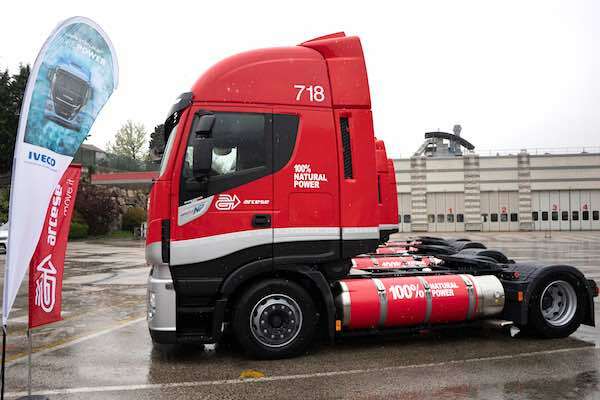 These new vehicles – the first LNG-fuelled low floor trucks delivered in Europe – are a strategic investment for Arcese and will be part of a fleet counting 700 vehicles operating across Italy and Europe. Arcese’s decision to convert part of its fleet to alternative fuels confirms the company’s intention to provide an excellent service while protecting the environment and meet the European Union’s 2030 target to reduce CO2 emissions from industrial and commercial vehicles by 30%. * Data declared by the manufacturer for the low floor truck. Non-low floor vehicles have an autonomy of up to 1,600 km. ** Data declared by the manufacturer for the low floor truck.